For other people named Abigail Adams, see Abigail Adams (disambiguation). Abigail Adams (née Smith; November 22, [O.S. November 11] 1744 – October 28, 1818) was the wife and closest advisor of John Adams, as well as the mother of John Quincy Adams. She is sometimes considered to have been a Founder of the United States, and is now designated as the first Second Lady and second First Lady of the United States, although these titles were not used at the time. Adams's life is one of the most documented of the First Ladies: she is remembered for the many letters she wrote to her husband while he stayed in Philadelphia, Pennsylvania, during the Continental Congresses. John frequently sought the advice of Abigail on many matters, and their letters are filled with intellectual discussions on government and politics. Her letters also serve as eyewitness accounts of the American Revolutionary War home front. 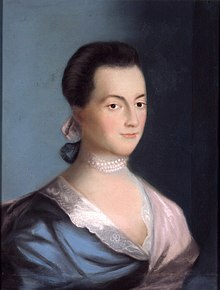 Abigail Adams was born at the North Parish Congregational Church in Weymouth, Massachusetts, to William Smith (1707–1783) and Elizabeth (née Quincy) Smith. On her mother's side, she was descended from the Quincy family, a well-known political family in the Massachusetts colony. Through her mother she was a cousin of Dorothy Quincy, wife of John Hancock. Adams was also the great-granddaughter of John Norton, founding pastor of Old Ship Church in Hingham, Massachusetts, the only remaining 17th-century Puritan meetinghouse in Massachusetts. Smith married Elizabeth Quincy in 1742, and together they had four children, including three daughters: one born in 1743, Abigail born in 1744 and another born in 1745. Their only son, born in 1746, died of alcoholism in 1787. As with several of her ancestors, Adams's father was a liberal Congregational minister: a leader in a Yankee society that held its clergy in high esteem. Smith did not focus his preaching on predestination or original sin; instead he emphasized the importance of reason and morality. In July 1775 his wife Elizabeth, with whom he had been married for 33 years, died of smallpox. In 1784, at age 77, Smith died. Abigail did not receive formal schooling; she was frequently sick as child, something which may have been a factor preventing her from receiving an education. :7 Later in life, Adams would also consider that she was deprived an education because females were rarely given such an opportunity. :7 Although she did not receive a formal education, her mother taught her and her sisters Mary (1739–1811) and Elizabeth (1742–1816, known as Betsy) to read, write and cipher; her father's, uncle's and grandfather's large libraries enabled the sisters to study English and French literature. Her grandmother, Elizabeth Quincy, also contributed to Adams' education. :8 As she grew up, Adams read with friends in an effort to further her learning. :8 As an intellectually open-minded woman for her day, Adams' ideas on women's rights and government would eventually play a major role, albeit indirectly, in the founding of the United States. She became one of the most erudite women ever to serve as First Lady. Abigail Smith first met John Adams when she was 15 years old in 1759. John accompanied his friend Richard Cranch to the Smith household. Cranch was engaged to Adams' older sister, Mary, and they would be the parents of federal judge William Cranch. Adams reported finding the Smith sisters neither "fond, nor frank, nor candid." Although Adams' father approved of the match, her mother was appalled that her daughter would marry a country lawyer whose manner still reeked of the farm, but eventually she gave in. The couple married on October 25, 1764, in the Smiths' home in Weymouth. Smith, Abigail's father, presided over the marriage of John Adams and his daughter. After the reception, the couple mounted a single horse and rode off to their new home, the small cottage and farm John had inherited from his father in Braintree, Massachusetts. Later they moved to Boston, where his law practice expanded. The couple welcomed their first child nine months into their marriage. Her childrearing style included relentless and continual reminders of what the children owed to virtue and the Adams tradition. Adams was responsible for family and farm when her husband was on his long trips. "Alas! ", she wrote in December 1773, "How many snow banks divide thee and me." Abigail and John's marriage is well documented through their correspondence and other writings. Letters exchanged throughout John's political obligations indicate his trust in Abigail's knowledge was sincere. Like her husband, Abigail often quoted literature in her letters. Historian David McCullough claims that she did so "more readily" than her husband. Their correspondence illuminated their mutual emotional and intellectual respect. John often excused himself to Abigail for his "vanity", exposing his need for her approval. He moved the family to Boston in April 1768, renting a clapboard house on Brattle Street that was known locally as the "White House." He and Abigail and the children lived there for a year, then moved to Cold Lane; still later, they moved again to a larger house in Brattle Square in the center of the city. John's growing law practice required changes for the family. In 1771, he moved Abigail and the children to Braintree, but he kept his office in Boston, hoping the time away from his family would allow him to focus on his work. Nevertheless, after some time in the capital, he became disenchanted with the rural and "vulgar" Braintree as a home for his family. In August 1772, therefore, Adams moved his family back to Boston. He purchased a large brick house on Queen Street, not far from his office. In 1774, Abigail and John returned the family to the farm due to the increasingly unstable situation in Boston, and Braintree remained their permanent Massachusetts home. Abigail also took responsibility for the family's financial matters, including investments. Investments made through her uncle Cotton Tufts in debt instruments issued to finance the Revolutionary War were rewarded after Alexander Hamilton's First Report on the Public Credit endorsed full federal payment at face value to holders of government securities. One recent researcher even credits Abigail's financial acumen with providing for the Adams family's wealth through the end of John's lifetime. In 1784, she and her daughter Nabby joined her husband and her eldest son, John Quincy, at her husband's diplomatic post in Paris. Abigail had dreaded the thought of the long sea voyage, but in fact found the journey interesting. At first she found life in Paris difficult, and was rather overwhelmed by the novel experience of running a large house with a retinue of servants. However, as the months passed she began to enjoy herself: she made numerous friends, discovered a fondness for the theatre and opera, and was fascinated by Parisian women's fashions, although she ruefully admitted that she "would never be in the mode". After 1785, she filled the role of wife of the first U.S. minister to the Court of St James's (Britain). In contrast to Paris, Abigail disliked London, where she had few friends and was in general cold-shouldered by polite society. One pleasant experience was her temporary guardianship of Thomas Jefferson's young daughter Mary (Polly), for whom Abigail came to feel a deep and lifelong love. She and John returned in 1788 to a house known as the "Old House" in Quincy, which she set about vigorously enlarging and remodeling. It is still standing and open to the public as part of Adams National Historical Park. Adams brought the children of brother William Smith, her brother-in-law John Shaw, and her son Charles to live in the President's House during her husband's presidency because the children's respective fathers all struggled with alcoholism. Charles' daughter, Suzannah, was just 3 years old in 1800 when Adams brought her to live in the President's House in Philadelphia days before Charles' death. With the relocation of the capital to Washington, D.C., in 1800, she became the first First Lady to reside at the White House, or President's House as it was then known. Adams moved into the White House in November 1800, living there for only the last four months of her husband's term. The city was wilderness, the President's House far from completion. She found the unfinished mansion in Washington "habitable" and the location "beautiful"; but she complained that, despite the thick woods nearby, she could find no one willing to chop and haul firewood for the First Family. Abigail did use the East Room of the White House to hang up the laundry. Adams' health, never robust, suffered in Washington. After John's defeat in his presidential re-election campaign, the family retired to Quincy in 1800. Abigail followed her son's political career earnestly, as her letters to her contemporaries show. In later years, she renewed correspondence with Thomas Jefferson, having reached out to him upon the death of his daughter Maria Jefferson Eppes (Polly), whom Abigail had cared for and come to love when Polly was a small child in London, even though Jefferson's political opposition to her husband had hurt her deeply. She continued to raise her granddaughter Suzannah. She also raised her elder grandchildren, including George Washington Adams and a younger John Adams, while John Quincy Adams was minister to Russia. Adams' daughter, Nabby, died of breast cancer in 1813, having endured three years of severe pain. Adams died on October 28, 1818, of typhoid fever. She is buried beside her husband in a crypt located in the United First Parish Church (also known as the Church of the Presidents) in Quincy, Massachusetts. She was 73 years old, exactly two weeks shy of her 74th birthday. Her last words were, "Do not grieve, my friend, my dearest friend. I am ready to go. And John, it will not be long." Abigail Adams wrote about the troubles and concerns she had as an eighteenth-century woman and she was an advocate of married women's property rights, more opportunities for women, particularly in the field of education. Women, she believed, should not submit to laws not made in their interest, nor should they be content with the simple role of being companions to their husbands. They should educate themselves and thus be recognized for their intellectual capabilities, so they could guide and influence the lives of their children and husbands. She is known for her March 1776 letter to John and the Continental Congress, requesting that they, "remember the ladies, and be more generous and favorable to them than your ancestors. Do not put such unlimited power into the hands of the Husbands. Remember all Men would be tyrants if they could. If particular care and attention is not paid to the Ladies we are determined to foment a Rebellion, and will not hold ourselves bound by any Laws in which we have no voice, or Representation." John declined Abigail's "extraordinary code of laws," but acknowledged to Abigail, "We have only the name of masters, and rather than give up this, which would completely subject us to the despotism of the petticoat, I hope General Washington and all our brave heroes would fight." Adams believed that slavery was evil and a threat to the American democratic experiment. A letter written by her on March 31, 1776, explained that she doubted most of the Virginians had such "passion for Liberty" as they claimed they did, since they "deprive[d] their fellow Creatures" of freedom. A notable incident regarding this happened in Philadelphia in 1791, where a free black youth came to her house asking to be taught how to write. Subsequently, she placed the boy in a local evening school, though not without objections from a neighbor. Adams responded that he was "a Freeman as much as any of the young Men and merely because his Face is Black, is he to be denied instruction? How is he to be qualified to procure a livelihood? ... I have not thought it any disgrace to my self to take him into my parlor and teach him both to read and write." I acknowledge myself a unitarian – Believing that the Father alone, is the supreme God, and that Jesus Christ derived his Being, and all his powers and honors from the Father ... There is not any reasoning which can convince me, contrary to my senses, that three is one, and one three. She also asked Louisa Adams in a letter dated January 3, 1818, "When will Mankind be convinced that true Religion is from the Heart, between Man and his creator, and not the imposition of Man or creeds and tests?" Historian Joseph Ellis has found that the 1200 letters between John and Abigail "constituted a treasure trove of unexpected intimacy and candor, more revealing than any other correspondence between a prominent American husband and wife in American history." Ellis (2011) says that Abigail, although self-educated, was a better and more colorful letter-writer than John, even though John was one of the best letter-writers of the age. Ellis argues that Abigail was the more resilient and more emotionally balanced of the two, and calls her one of the most extraordinary women in American history. The Abigail Adams Cairn – a mound of rough stones – crowns the nearby Penn Hill from which she and her son, John Quincy Adams, watched the Battle of Bunker Hill and the burning of Charlestown. At that time she was minding the children of Dr. Joseph Warren, president of the Massachusetts Provincial Congress, who was killed in the battle. An Adams Memorial has been proposed in Washington, D.C., honoring Adams, her husband and other members of their family. One of the subpeaks of New Hampshire's Mount Adams (whose main peak is named for her husband) is named in her honor. Passages from Adams' letters to her husband figured prominently in songs from the Broadway musical 1776. Virginia Vestoff played Adams in the original 1969 Broadway production of 1776 and recreated the role for the film version in 1972. On television, Kathryn Walker and Leora Dana in the 1976 PBS mini-series The Adams Chronicles. In the mini-series John Adams, which premiered in March 2008 on HBO, she was played by Laura Linney. Linney enjoyed portraying Adams, saying that "she is a woman of both passion and principle." A revolution-era Abigail, circa 1781, is portrayed by Michelle Trachtenberg, on the television series, Sleepy Hollow, in the season 2 episode, "Pittura Infamante" (January 19, 2015), her assistance being crucial in ending a series of unexplained murders from the period. Adams is a featured figure on Judy Chicago's installation piece The Dinner Party, being represented as one of the 999 names on the Heritage Floor. The First Spouse Program under the Presidential $1 Coin Program authorizes the United States Mint to issue half-ounce $10 gold coins and bronze medal duplicates to honor the first spouses of the United States. The Abigail Adams coin was released on June 19, 2007, and sold out in just hours. She is pictured on the back of the coin writing her most famous letter to John Adams. In February 2009 Coin World reported that some 2007 Abigail Adams medals were struck using the reverse from the 2008 Louisa Adams medal, apparently by mistake. These pieces, called mules, were contained within the 2007 First Spouse medal set. The U.S. Mint has not released an estimate of how many mules were made. ^ Encyclopædia Britannica (2007). Founding Fathers: The Essential Guide to the Men Who Made America. Hoboken: John Wiley and Sons. ISBN 0470117923. ^ a b Kathryn Cullen-DuPont (August 1, 2000). Encyclopedia of women's history in America. Infobase Publishing. pp. 3–4. ISBN 978-0-8160-4100-8. Retrieved November 28, 2011. ^ a b c d e f g h i j "Abigail Adams Biography: National First Ladies' Library". Firstladies.org. Retrieved September 7, 2016. ^ "American Experience | John & Abigail Adams | People & Events". PBS. Retrieved September 7, 2016. ^ a b c d e f "Abigail Adams". April 21, 2001. ^ a b c d Holton, Woody (June 1, 2010). Abigail Adams. Simon and Schuster. ISBN 9781451607369. ^ McCullough 2001, pp. 51-52. ^ "Abigail Adams Biography - Adams National Historical Park". www.nps.gov. U.S. National Park Service. Retrieved November 16, 2016. ^ Gilles, Edith Belle (2002). Abigail Adams: A Writing in Life. Routledge. p. xv. ISBN 978-0-415-93945-4. ^ a b Garry Wills, Henry Adams and the Making of America, 2005; p. 24; Wills cites the criticisms of Paul Nagel "and others"
^ McCullough 2001, p. 272. ^ "American Experience – John & Abigail Adams – Timeline – PBS". pbs.org. Retrieved September 7, 2015. ^ a b Saxton, Martha (November 1, 2010). "Abigail Adams, Capitalist". Women's Review of Books. Retrieved October 27, 2017. ^ "Basic Information - Adams National Historical Park (U.S. National Park Service)". www.nps.gov. Retrieved November 16, 2016. ^ "Abigail Smith Adams". whitehouse.gov. 2014. Retrieved November 17, 2016. ^ a b c d e Seale, William; Association, White House Historical (January 1, 2002). The White House: Actors and Observers. UPNE. ISBN 9781555535476. ^ Anthony, Carl Sferrazza (November 2, 2000). America's First Families: An Inside View of 200 Years of Private Life in the White House. Simon and Schuster. ISBN 9780684864426. ^ "John Adams moves into White House - Nov 01, 1800 - HISTORY.com". HISTORY.com. Retrieved November 17, 2016. ^ "Abigail Adams used the East Room to dry the laundry". Whitehousehistory.org. White House Historical Association. Retrieved September 7, 2016. ^ "American Experience | John & Abigail Adams | People & Events | PBS". www.pbs.org. Retrieved November 17, 2016. ^ Withey (1981) p x. ^ Withey (1981) p 82. ^ Adams, John; Adams, Abigail (March – May 1776). "Letters of Abigail Adams". Letters Between Abigail Adams and Her Husband John Adams. liz library. ^ "Letter from Abigail Adams to John Adams, 13 February 1797". Adams Family Papers: An Electronic Archive. Massachusetts Historical Society. ^ "Abigail Adams Biography". Firstladies.org. National First Ladies' Library. Retrieved September 7, 2016. ^ "From Abigail Smith Adams to Louisa Catherine Johnson Adams, 3 …". Founders.archives.gov. July 12, 2016. Retrieved September 7, 2016. ^ "First Lady Abigail Adams". C‑SPAN. March 4, 2013. Retrieved November 2, 2014. ^ Holton, Woody (2009). Abigail Adams. New York, NY: Free Press Division of Simon & Schuster. p. 79. ISBN 978-1-4165-4680-1. ^ Taylor, Bethany (Summer–Fall 2011). "Abigail Adams Joins the Presidential Range". Appalachia. Appalachian Mountain Club (Volume 62, No. 2): 132. ^ U.S. Mint: First Spouse Program. Accessed 2008-06-27. "The United States Mint also produces and make available to the public bronze medal duplicates of the First Spouse Gold Coins." Abrams, Jeanne E. First Ladies of the Republic: Martha Washington, Abigail Adams, Dolley Madison, and the Creation of an Iconic American Role (NYU Press, 2018). Barker-Benfield, G.J. Abigail and John Adams: The Americanization of Sensibility (University of Chicago Press; 2010). Bober, Natalie S. 1995. Abigail Adams: Witness to a revolution New York: Simon & Schuster Children's Publishing Division. Ellis, Joseph J. First Family: Abigail and John Adams (New York: Alfred A. Knopf, 2010). Gelles, Edith B. Portia: The World of Abigail Adams (Bloomington: Indiana University Press, 1991). Gelles, Edith B. First Thoughts: Life and Letters of Abigail Adams (New York: Twayne Publishers, 1998), reissued as Abigail Adams: A Writing Life (London and New York: Routledge, 2002). Gelles, Edith Belle. "The Adamses Retire." Early American Studies 4.1 (2006): 1-15. Gelles, Edith B. Abigail and John: Portrait of a Marriage (New York: William Morrow, 2009) – finalist for the 2010 George Washington Book Prize. Holton, Woody. Abigail Adams: A Life (New York: Free Press, 2009) – winner of the 2010 Bancroft Prize. Kaminski, John P., editor The Quotable Abigail Adams (Cambridge, MA: Belknap Press of Harvard University Press, 2009). McCullough, David (2001). John Adams. New York: Simon & Schuster. ISBN 978-1-4165-7588-7. Shields, David S., and Fredrika J. Teute. "The Court of Abigail Adams." Journal of the Early Republic 35.2 (2015): 227-235. Hogan, Margaret A. "Abigail Adams: The Life and the biographers." in David Waldstreicher, ed. A Companion to John Adams and John Quincy Adams (2013) pp 218-38. The Letters of John and Abigail Adams ed by Frank Shuffelton (2003). Wikimedia Commons has media related to Abigail Adams. "Adams, Abigail" . Appletons' Cyclopædia of American Biography. 1900. "Adams, Abigail Smith" . New International Encyclopedia. 1905. "Adams, Abigail Smith" . Encyclopedia Americana. 1920. Michals, Debra. "Abigail Adams". National Women's History Museum. 2015.